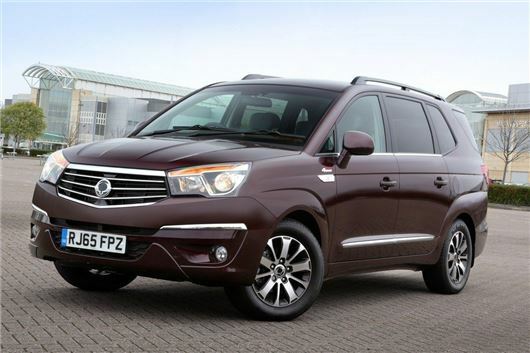 SsangYong has given its cavernous Turismo people carrier an overhaul with a new engine and a Mercedes-Benz sourced seven-speed automatic gearbox. The new 2.2-litre e-XDi220 diesel engine has 178PS with 400Nm - an improvement over the old 2.0-litre diesel. Fuel economy is also better with the Turismo now capable of averaging 39.2mpg according to the official figures - an increase of 2mpg. Emissions for the big seven-seater have dropped from 199g/km to 189g/km for the six-speed manual gearbox version, although it still sits in VED band J which is currently £265 a year. As before, the SE and EX models are rear wheel drive while the ELX has a selectable 4x4 system complete with a low ration setting. It makes the Turismo one of the very few MPVs available with 4WD. As with other Turismo models the ELX has a 2.0 tonne towing capability. Available to order now, prices start at just £18,995 while the ELX model is £24,995. As with all SsangYong models, the Turismo comes with a five year unlimited mileage warranty which is the most comprehensive on the market covering all the major mechanical components along with suspensions joints and buses, shock absorbers and even the audio system.